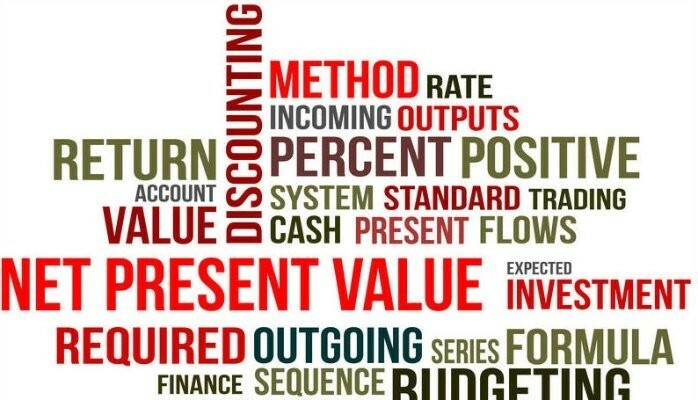 Discounted Cash Flow (DCF) analysis is a method of valuing a project, company, or asset using the concepts of the time value of money. Each cash inflow/outflow is discounted back to its present value (PV). Then they are summed to calculate the Net Present Value (NPV). NPV is one of the most robust financial evaluation tools to estimate the value of an investment, a monetary value of the project’s net cash flows after allowing for cost of capital and risk; not the same as profit, because it’s cash-based. The calculation of NPV required identifying the size and timing of the expected future cash flows generated by the project or investment and determining the discount rate or the estimated rate of return for the project. The expected cash flows are then calculated from all the possible cash flows and their associated probabilities. NPV as a decision making tool: the higher NPV the higher the investment opportunity. If NPV=0, then the investment will contribute to a fair return based on planned Internal Rate of Return (IRR) – the investment will not add a monetary value to the company, the decision to go ahead or not will depend on other factors not explicitly included in the calculation. The IRR is defined as the discount rate that makes the project have NPV=0. It relates to the Return on Capital Employed Ratio (ROCE) which measures surplus (return) earned on commercial activity. IRR is an alternative method of evaluating software investmentswithout estimating the discount rate. IRR takes into account the time value of money by considering the cash flows over the lifetime of a project (N is the last year of the project or investment). Calculating the IRR is typically done through a trial-and-error process that looks for the discount rate that makes an NPV equal to zero. IRR as a decision making tool: the higher IRR the better potential return on investment. Projects are regarded as economically viable if their IRR exceeds the expected cost of capital for organizations and projects having a similar risk. However, IRR is not a great indicator as to the magnitude of investment needed, benefit value or payback, so the returns may be high, but the investment high, benefits not significant and/or payback (risk) too high. Despite a strong academic preference for NPV, surveys indicate that executives prefer IRR over NPV. Payback period refers to the period of time required for the return on an investment to recover an initial investment through cash flows generated by the investment. It tells about the level of profitability of an investment in relation to time; the shortest payback period is preferable. Limitations of the payback period analysis include the fact that it does not address the time value of money, nor does it go beyond the recovery of the initial investment. But despite this, payback is in wider use than NPV and even accounting practitioners are sometimes reluctant to use NPV. Projects with shorter payback periods are sometimes preferred because they put less strain on liquidity. This post was originally published on LinkedIn on 31 May 2015.